Walking along the eight Walsall Locks you wouldn't think that this was once a very busy section of the BCN . 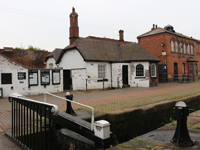 Today the Walsall Branch Canal is fairly grim backwater, opened in 1841 it lifts the canal up to the 473ft Wolverhampton level at Birchills Junction. At the top lock there is an interesting collection of buildings, a former mission that offered boaters a bath and spiritual enlightenment rather than alcohol and also served as the Birchills Canal Museum before the money ran out. Interestingly, there's also a dovecot, an infrequent sight in this part of the world. Much more common, a collection of shopping trollies, can be observed below Birchills Aqueduct. At the junction with the Wyrley and Essington Canal, we go left. A right turn would have taken us to the power stations that served Walsall from 1916 to 1982, the original one had all its coal delivered by canal and their cooling towers relied on water from the canal. It would be good to say something nice but even the towpath graffiti is half hearted, although there is a useful map painted under Stokes Bridge. Sneyd Narrows, Wharf and Junction provide some interest on this fairly pleasant section but the rumble of traffic builds as the M6 is approached. By the time Roughwood Narrows and Bentley Wharf Bridge are reached the road noise has diminished and there's a nature reserve. Adjacent houses engage the canal up to Lane Head Bridge where refreshment can be had at 'The Bridge' or the 'United Kingdom' or both.